Stag at Sharkey’s, 1909. George Bellows (American, 1882–1925). Oil on canvas; 92 x 122.6 cm. The Cleveland Museum of Art, Hinman B. Hurlbut Collection 1133.1922. 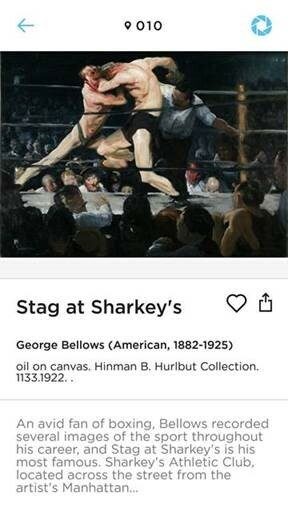 ArtLens, Cleveland Museum of Art's collection app for iOS and Android devices, provides current information about the more than 4,100 objects that are currently on view, as well as guidance through the galleries for browsing the collection and both museum produced and visitor-created tours. While in the galleries, museum visitors can scan artwork marked with the ArtLens iris logo to reveal additional interpretive content. The ArtLens app also allows museum visitors to connect with the award-winning ArtLens Wall to collect their favorites. ArtLens features more than nine hours of video content, including conversations like these three videos for Stag at Sharkey’s, 1133.1922.